I gained .4 pounds this week. The good thing is since I went from 183.8 to 184.2 muscletank sees both of those as 184. Thus I still have Lost 50 pounds next to my name. It's psychological but it's nice. Anyway, I think the gain might, just might be related to my three candy bar meltdown earlier this week and the lack of exercise. I'm going to come back next week! Unfortunately I've been coughing all week. It's irritating as hell. I said I wasn't going to go to the gym until it was gone but I broke down and went. I felt like it was getting to be too long since I'd gone and feared my good habits might go away. I did 10 minutes on the elliptical and 10 minutes on the bike. I went really slow and kept my heart rate under 140 the whole time, actually most of the time it was in the 120's. Then I did most of my lower body weight training work out - squats, lunges, leg presses. I did some crunches and hanging leg raises. My legs are a little sore today. I guess that's what happens when you take a week off. It felt really good to be back in the gym and I'm so looking forward to the day I can do my full work out again. Here are pics of the Weight Watchers charms. 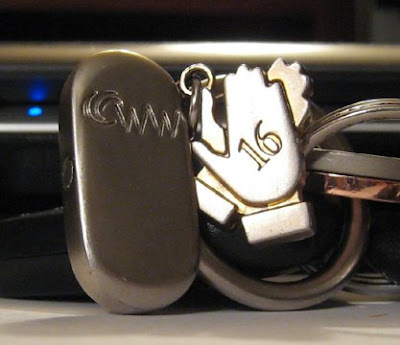 The first is the keychain and the 16 week charm. They give you the keychain when you lose 10% of your body weight. They give you the clapping hands at 16 weeks to show you've made new habits.